The attack comes as hundreds of thousands of Shiite pilgrims are making their way to Karbala to commemorate Arbaeen. BAGHDAD — A double car bombing and a shooting killed 34 Shiite Muslims on pilgrimage in Iraq on Monday, the deadliest in a wave of attacks across the country that left at least 65 dead. It was the bloodiest day of violence in nearly two months. Police officials said the worst attack took place Monday night in the southern Baghdad suburb of al-Rasheed, when two car bombs struck a group of Shiite pilgrims walking to the holy Shiite city of Karbala, killing 23 and wounding 55. 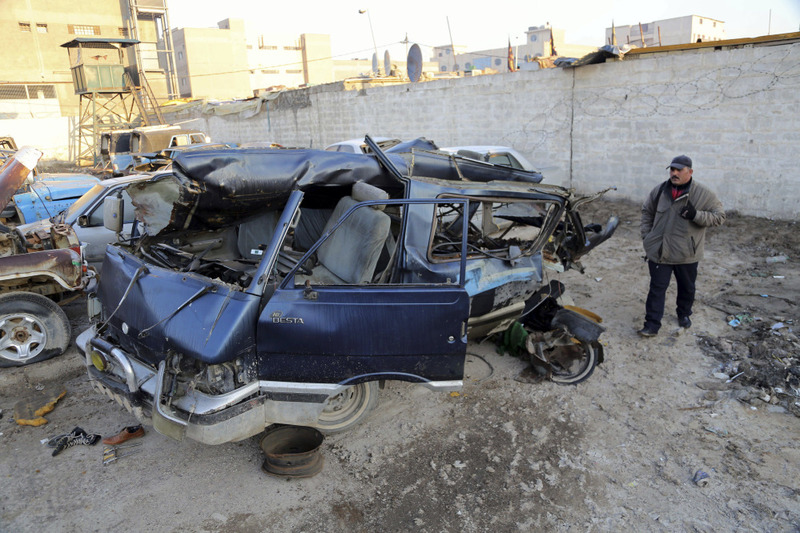 The Associated Press An Iraqi man inspects damaged vehicles in a car bomb attack in Baghdad, Iraq, Monday, Dec. 16, 2013. Iraqi officials say bombings in and around Baghdad have killed and wounded tens of people. Hundreds of thousands of Shiite pilgrims are making their way to the city to commemorate Arbaeen, the end of 40 days of mourning following the anniversary of the death of the Prophet Muhammad’s grandson, Imam Hussein, a revered Shiite figure. Earlier in the day, gunmen opened fire on a bus in Mosul that was carrying Shiite pilgrims traveling also to Karbala, killing 11 and wounding eight. Mosul is located about 360 kilometers (225 miles) northwest of Baghdad. Sunni Muslim insurgents in Iraq frequently attack Shiites, who they consider infidels. Usually, Shiite marches to holy cities are poorly protected by Iraqi security forces. In other violence on Monday, a group of suicide bombers launched a brazen attack on a police station in the town of Beiji, a former insurgent stronghold 250 kilometers (155 miles) north of Baghdad, where a suicide bomber rammed his explosives-laden car into the main gate of the town police station. That explosion paved the way for three other suicide bombers who were on foot to storm inside and blow themselves up in the building, a police officer said. Eight policemen, including an officer, were killed while five were wounded in the attack, he said. Later in the morning, several bombings hit different parts of Baghdad and northern Iraq, police said. In southeastern Baghdad, a parked car bomb ripped through a parking lot, killing six civilians and wounding 12. Another parked car bomb went off in the central Salhia neighborhood near the heavily fortified Green Zone where key government offices and foreign embassies are located. That attack killed five civilians and wounded 14. Four civilians were killed and 11 were wounded when a parked car bomb exploded at an outdoor market in Baghdad’s central Sadriyah neighborhood. A bomb went off near a bus station in the nearby al-Nahda area, killing three people and wounding seven. Another bomb in the eastern suburb of Hussainiyah killed one civilian and wounded seven. And two other civilians were killed and seven wounded in a car bomb explosion in the southeastern suburb of Jisr Diyala. In the northern city of Tikrit, some 130 kilometers (80 miles) north of Baghdad, three suicide bombers set off their explosives belts in a bid to break into the building of the city council. Two civilians were killed in that attack and seven were wounded. There was no immediate claim of responsibility for the attacks, but insurgent groups, mainly al-Qaida and other Sunni militants, frequently target civilians in cafes and public areas, Shiites, as well as members of the Iraqi security forces, in an attempt to undermine confidence in the Shiite-led government and stir up Iraq’s already simmering sectarian tensions. At least 288 people have died in attacks across the country so far this month, according to an Associated Press count. Monday was the deadliest day of attacks since Oct. 27, when 71 people were killed. Monday’s bombings were the latest episode in a wave of violence that has roiled Iraq since a security crackdown in April on a protest camp in a northern Sunni town.